One of the initial reasons for the founding of St. George in 1814 was industry. In the early 1800’s, Ontarian natural resources were a prized product all over Canada and abroad. St. George was an integral part of this trade. Standing amid fields, near to the swiftly-flowing Grand River, St. George was the model of a settlers’ town. It boasted mills to grind farmer’s grain into flour and feed, sawmills, blacksmiths, and manufacturing facilities. One particularly prominent gristmill stood on the outskirts of St. George, a symbol of the sophistication of the town. St. George also possessed numerous manufacturing factories, creating such items as wagon wheels, sleighs and agricultural machinery. 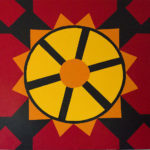 This quilt block features a motif of crossed wrenches, sable, on a ruby field, surmounted by a toothed gear. The wrenches are just one example of the tools and agricultural implements created in St. George; what says “industry” as well as a gear? Whether part of a carriage or a separate product, gears are a major component of industry world-wide and in St. George, too.